Proper ghosts need time to ripen. In 1875, the Duke of Argyll, Scotland dashed off a puzzling little missive to the editor of a 19th Century literary monthly called Good Words offering a rather detailed account of an extraordinary encounter with a ghostly army on the road from Glen Aray, a tale told to him by his late father, the previous Duke of Argyll, which he set out to corroborate when he discovered references to the incident in old papers, attributing the original spectral vision to a father and son by the name of Bell, going as far as to verify that many of the local geographical references were stunningly accurate, noting that simple elements like thorn bushes mentioned still existed or that specific groves of trees had once stood in the vicinity where the tale placed them. While the Duke could not determine a precise date for the Bell’s phantom vision, he was able to definitively determine that it occurred no earlier than 1746 and no later than 1753. The Bell’s story of running into an enormous, roughly contemporary army marching on the road from Glen Aray to Invernay between 1746-1753 (specifically in June-July), observing its movements for quite some time, and then watching it spontaneously vanish has long stumped historians, folklorists, and anomalists alike, and in a rare case of agreement among them, none seem to be able to account for the massive troop, ghostly or otherwise. Your sober historian will point out that there weren’t any major armies moving around in Scotland after April 1746 and that because explanations involving ghosts are not particularly publishable in the current academic outlets, tend to just ignore it. Folklorists are equally mystified and prefer simply to lump it with stories of all manner of phantom armies that recur throughout the ages. Lots of people die in horrific ways during our neverending wars. This clearly lends itself to a little hauntiness. Your savvy anomalists point out that all you need to do is believe in ghosts and the answer is obvious, completely ignoring the fact that the force described was clearly an 18th Century army, familiarly organized, armed with roughly contemporary weapons, and yet still able to vanish without a trace before the eyes of witnesses. 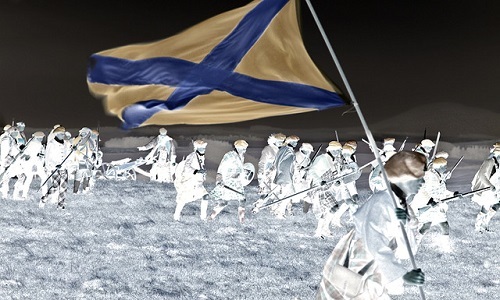 Luckily, there are a few tantalizing clues that suggest the Bell’s may have actually seen the uniquely recent ghosts of the gory April 1746 Battle of Culloden , that is, the last pitched battle fought in Scotland, ending the hopes of the Jacobites two months before a spectral legion was spotted marching to its death through Argyllshire. I can hardly do better than to quote the original story, compiled from papers written by the grandson of the elder Mr. Bell of Invernay. My grandfather was then a farmer in Glenaray (which you know is within four miles of this place), and my father, who was at that time a young unmarried man, resided in the family with him. On the morning of the day above mentioned, my grandfather having occasion to transact some business in Glenshira, took my father along with him; they went there by crossing the hill which separates it from Glenaray, and their business in Glenshira being finished a little after midday, they came round by Inveraray in order to return home. At that time the road generally used from Glenshira to Inveraray lay upon the west side of the river of Shira all the way to the Garron Bridge, where it joined the high road, which leads from Inveraray to the low country by that bridge. As soon as they came to that bridge, and had turned towards Inveraray upon the high road, being then (as you know) within view of a part of the old town of Inveraray, which has been since demolished, the ground upon which the new town presently stands, and of the whole line of road leading from it, to the above-mentioned bridge, they were very much surprised to behold a great number of men under arms, marching on foot towards them. At this time the foremost ranks were only advanced as far as Kilmalieu. They were marching in regular order, and as closely as they could move, from the point of the new town, near the quay, where Captain Gillis’s house now stands, along the shore, and high road, and crossing the river of Aray near the town at or about the spot where the new bridge has since been built. Of the rear, there appeared to be no end. The ground upon which the new town now stands was then surrounded by a park wall, and the road beyond it lay in a circular direction between that wall and the sea. From the nature of the ground, my father and grandfather could see no further than the wall; and, as the company was advancing in front, the rear as regularly succeeded, and advanced from the furthest verge of their view. This extraordinary sight, which was wholly unexpected, so much attracted their attention that they stood a considerable time to observe it. They then walked slowly on, but stopped now and then, with their eyes constantly fixed upon the objects before them. Meantime, the army continuing regularly to advance; they counted that it had fifteen or sixteen pairs of colours; and they observed that the men nearest to them, were marching upon the road, six or seven abreast, or in each line, attended by a number of women and children, both above and below the road, some of whom were carrying tin cans, and other implements for cooking, which I am told is customary upon a march. They were clothed in red—but as to this particular circumstance, I do not recollect whether my grandfather mentioned it or not, though I know my father did—and the sun shone so bright, that the gleam of their arms, consisting of muskets and bayonets, dazzled their sight. They also observed between Kilmalieu and the salmon draught an animal, resembling a deer, or a horse, in the middle of a crowd of soldiers, who were (as they conjectured) stabbing or spurring it forward with their bayonets. My father, who had never seen an army before, naturally put a number of questions to my grandfather—who had served with the Argyllshire Highlanders, in assisting to suppress the Rebellion in 1745—concerning the probable route and destination of this army, which was now advancing towards them, and the number of men of which it seemed to consist. My grandfather replied that he supposed it had come from Ireland, and had landed in Kintyre, and that it was proceeding to England; and that, in his opinion, it was more numerous than the armies on both sides at the Battle of Culloden…My father and grandfather were now come to the thorn-bush, between the Garron Bridge and the gate of the deer park, and at the same time the van of the army had advanced very near to that gate, which you know is but a very short distance (I believe not above a hundred and fifty or two hundred yards) from the thorn-bush, and as the road forms into a right-angled corner at that gate, and the front of the army being then directly opposite to them, they halted, of course, a better opportunity of observing it minutely than they had at first done. The vanguard, they then observed, consisted of a party of forty or fifty men, preceded by an officer on foot; at a little distance behind them, another officer appeared, riding upon a grey dragoon horse. He was the only person they observed on horseback, and from his appearance and station in the march, they considered him as the commander-in-chief. He had on a gold-laced hat, and a blue hussar cloak, with wide open sleeves, all lined with red. He also wore boots and spurs; the rest of his dress they could not see. My father took such particular notice of him that he often declared he would have known him perfectly well, if he had ever seen him again. Behind this officer, the rest of the army marched all in one body, so far as they observed, but attended by women and children, as I mentioned above. My father’s curiosity being now sufficiently gratified, he thought it was high time to provide for his own security. He represented to my grandfather that it was very probable these men, who were advancing towards them, would force them to go along with them, or use them otherwise ill; and he therefore proposed that they should both go out of their way, by climbing over the stone dyke which fences the deer park from the high road, observing that the spot where they then were was very convenient for that purpose, as the thorn-bush would help to conceal them from their view while going over the dyke. To this my grandfather, objecting, said, that he was a middle-aged man, and had seen some service, he did not believe they would give any trouble to him; but he told my father, as he was a young man, and that they might probably take him along with them, he might go out of their way as he thought fit. Upon this my father leaped instantly over the dyke, he then walked behind it for a little time in the direction of the Garron Bridge, and when he had got about half way, he turned up towards the clumps of trees in the neighbourhood of the Bridge, believing that he was then out of the reach of pursuit, should any be attempted. But when he arrived near the clumps, he looked back to observe the motions of the army, and whether any person attempted to follow him, but he found, to his utter astonishment, that they were all vanished. Not a soul of them was to be seen (Argyll, 1875, p54-56). English psychologist and psychical researcher Edmund Gurney (1847-1888) noted that it would be hard to pass off such detail regarding an apparition as pareidolia or misidentification, but nonetheless dismissed the entire thing as hearsay, commenting “The collective vision of an army marching on terra firma, described by the Duke of Argyll in Good Words for Jan. 1875, would be less easy to account for as an illusion: but the record is second-hand, and was not written down till more than 50 years after the incident is alleged to have occurred” (Gurney, 1918, p476). If a professional doubter is not available on the scene to record it, it evidently cannot happen. Personally, I prefer to apply professional doubting to the value of Agile software development and the question of whether coffee should be a food group. When it comes to ghosts and monsters, I’ll hedge my bets. Even dedicated followers of the finer phantasms have to date been at a little bit of a loss to explain what exactly the ghostly army of Argyllshire was a ghost of. I mean, you can’t go around pointing out ghosts without preparing a proper backstory. You’ll never sell a script in this town again if you keep that sort of nonsense up. Part of the problem is that there is a certain expectation that ghosts would at least have the decency to spend a few years of quality time as a corpse, that is, we prefer our revenants to be rotten. Contemporary ghosts are just so…contemporary. This is the only reason I can think of that everyone scratches their heads and ignores the possibility that the bloody Battle of Culloden, which occurred in April 1746, managed to produce a massive ghostly army of the defeated Jacobites near Glen Aray in June 1746. Crazy you say? Crazy like a demented and paranoid fox who knows the hounds are chasing him and booby-traps the forest. They had it coming. They drew first blood. Curiously, as nobody seems to want to talk about it, the history fits the telltale clues in the story. The Jacobite uprising of 1745 was a French-backed attempt to put Charles Edward Stuart (“Bonnie Prince Charlie”) and thus the entire House of Stuart back on the throne of England, and action commenced with a landing of Charles and his troops at Glenfinnan in the Scottish highlands, supported by a gathering of Scottish clansmen, a detachment of Englishmen from the Macnhester regiment, and an assortment of Irish and Scots units in the service of the French, collectively referred to as the Jacobite Army. After some initial victories near Edinburgh, Bonnie Prince Charlie’s forces marched south for Carlisle, just over the Scottish border in England. If you take a moment and peruse a map of Scotland, and happen to have a Jacobite army laying about, the straightest line march between Glenfinnan, Scotland and Carlisle, England runs pretty much straight through Glen Aray and Invernay. At the time, the British Army was busy knocking heads in the War of Austrian Succession on the continent. When the Jacobites reached the midlands near Derby, the Hanoverians started to get nervy and recalled a few divisions to put the hurt on them, forcing the Jacobites to retreat to Inverness, near which was fought the final Battle of Culloden. A force of roughly 8000 Jacobites gathered at Culloden Moor on April 16, 1746, and were soundly trounced by some 7000 loyalist troops. A staggering 2000 Jacobites were killed and wounded by the British regulars, who lost only about 200 soldiers in a complete rout of Stuart’s army. This not only decisively ended the Jacobite Uprising of 1745, but in fact was also the last “pitched” (where both sides choose to fight at a location) battle fought on British soil. By June 1746, the Bells encountered the inexplicable vision of an army and its subsequent mysterious disappearance on the road headed south from Glen Aray to Invernay. This was no ephemeral apprehension of a Roman Legion, band of Medieval Vikings, a mob of angry Picts, or other equally antiquated host. This was a “modern” (as in 18th Century at the time) uniformed army, bearing muskets and bayonets, marching in close order under at least 16 different standards (suggesting an amalgamated force much like the Jacobites). Interestingly, the Hanoverian loyalists at the Battle of Culloden reported capturing 14 different standards after crushing the Jacobites. The elder Bell, a veteran of the Argyllshire Highlanders suggested that the army had most likely landed from Ireland, presumably noting the likely beachhead had been at a place such as Gelnfinnan (he actually mentioned Kintyre, similarly on the West Coast of Scotland, as a possibility) or noticing the presence of Irish standards (organized Irish units from the French Army were among Charles Stuart’s forces). Add to that the fact that the march of the Jacobite army towards Carlisle could quite reasonably have passed through Glen Aray, and it would seem that we have at least a circumstantial case for our incredible vanishing army to be either (1) a time slip – the Bells briefly seeing the replay of a scene mere months into the past, or (2) a ghostly memory of the men killed at Culloden, doomed to an eternal death march. Admittedly, my evidence is fairly thin, but frankly, I have a day job, and what truly startles me is that rather than draw the all too obvious preternatural connection between the phantom army and the Battle of Culloden, the spectral soldiers of 18th Century Argyllshire are largely ignored as simply being too close in time to actual events to render themselves to phantasmagoric explanations that, were they a band of Iron Age Gaels, aficionados of the odd would immediately seize upon. We do so like our weird, but we want our weird rooted in a past that can give form and substance, historical context and a compelling narrative, otherwise we’re left facing up to the distinct possibility that there are even stranger things afoot in the world than are encompassed by our already strange philosophies. It might be said that we must precisely distance ourselves from our ghosts to assure ourselves that we are envisioning a new future and not endlessly repeating the mistakes of our forefathers. Our ghosts must be old, as the dreams and nightmares of our predecessors must be, for as Olive Schreiner said, “Our fathers had their dreams; we have ours; the generation that follows will have its own. Without dreams and phantoms man cannot exist”. Argyll, Duke of. “An Argyllshire Vision”. Good Words v16. London: A. Strahan and Co., 1875. Gurney, Edmund. Phantasms of the Living. London: Kegan Paul, Trench, Trubner & Co., 1918. I write to express my appreciation for fine work, well written, nicely researched, reasonably presented. This is what keeps me searching the net for the occasional jewel of intellectual integrity. Thank you. Keep it up. Thank you, sir. People often say they write for themselves, but personally I like to spread the weirdness around. Thanks for spreading the weirdness, in both well researched and humourous form erudite sir. Im ex pat Northern Irish living with the mad Ch’ti folk in northern France now, and enjoy weirding them out even more. I enjoy the mix of history and weirdness, which is my amateur speciality too. Simply haven’t the self discipline to write anymore, or concentration, not to go off on multiple tangents. You do have a fanbase here in the outer limits of the interwebs, but just don’t get many comments as we’re too busy retelling your articles to the rest of the world. Many thanks for many hours of interesting reading and education. Keep it weird good sir.